Are you looking for the over-lock machine that has everything? 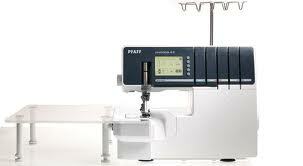 The PFAFF® coverlock™ 4.0 over-lock/serger is for you! Its ultra-modern design fulfills all promises. The most modern convenience and a huge repertoire of stitches means even more perfection and creativity. The PFAFF® coverlock™ 4.0 over-lock/serger machine offers all the features of the preceding models plus even more sophisticated extras. Graphic Touch Screen – All necessary information for the selected stitch is shown. Extended Info System – More information on the use of each stitch, right at your fingertips. Large Sewing Space – More Space for cover-stitch projects. Extension Table included – It gives an extra large support for beautiful results. 5, 4, 3, 2 Thread Sewing – Many options for utility and decorative sewing. 25 Stitches – Trim, stitch, overcast and decorate projects in half the time. Cover-stitches – great for sewing elastic hems, perfect for finishing all kinds of knitwear hems. Chain stitch – Join fabric layers where a traditionally pressed open seam is required. Works great as a basting stitch. 5-thread over-lock – combines two stitches for durable and reliable seams. 4-thread over-lock – reinforced over-lock stitch for perfect sewing, trimming and finishing. 3-thread over-lock – wide and narrow seams and decorative techniques. 2-thread over-lock – rolled edge and flat-lock, wide and narrow. Built-in rolled edge – sew 2 or 3-thread rolled hems quickly without changing the presser foot or stitch plate. Thread Tensions – Select the stitch and start to sew. The PFAFF® coverlock™ 4.0 automatically sets thread tension, differential feed and stitch length. Adjustable Settings – All settings can be adjusted for special fabric and techniques. Dual LED Light – Maximum illumination of the sewing area for optimal visibility. Memories – Save your personal setting for each stitch, uniquely naming them for instant recall. Last Stitch – The PFAFF® coverlock™ 4.0 remembers the latest stitch sewn when powering back on to instantly continue your project. Tension Release – Threads pull easily when presser foot is up. German Innovative Design – Built to make sewing easy and to achieve the professional results that sewers want. The PFAFF® coverlock™ 4.0 overlock machine with its innovative features, durability and ease of operation makes it the serger for you. Change from Over-lock to Cover-stitches – No needle plate/presser foot change needed at conversion for different stitches. Differential Feed – Adjustable for perfectly even seams, no stretching or puckering of fine fabrics. Speed – Sews 1100 stitches per minute to save time. 5 sewing speeds to easily adjust when you want more precision for different techniques. Thread Paths – Lay-in tension and color coded thread paths for quick and convenient threading. Cutting Blades – The upper cutter is movable to disengage for special techniques. Safety Lockout – When the front cover is open the machine will not sew. Carry Handle – Built-in extended carrying handle to move the machine without tangling the threads. Waste Tray – Catches fabric trimmings. Stop in for a demonstration today!